How not to brand cycling. Ooh, dangerous. Owner's manual?! I was at my local bike shop - one of the 25 within one km of my flat - and asked if he had owner's manuals since I'd never seen one or recieved one when buying a bike before. He just laughed. I don't care if it's one of those fixie things. I'll consider riding it. A Danish reader, Anne, sent this in. The Bicicle, she calls it, and rightly so. 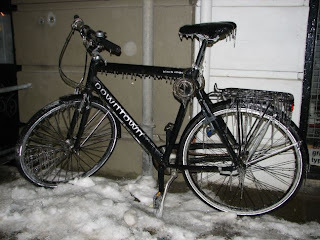 Careful where you park your bike in the winter. Beware of leaky eavestroughs.